I've thought since moving to Portland that duh, I need to change the URL of my blog, since we are no longer a "San Fran Family." So, here it is, finally. Posts from Portland. Just a continuation of this blog. I won't be posting here anymore, but I'll keep this blog up for posterity. I read in this morning's newspaper that Cindy Sheehan is calling it quits. She's not going to protest the war anymore or try to get an audience with President Bush. She's just going to go home and try to live a normal life. She feels betrayed by Congress, who after an amazing show of bravery on the Iraq front, decided to go ahead and give in to what Bush wanted as far as this "surge" goes. Why? I can't figure it out. Can someone explain to me why we elected a Democratic Congress? To act like this? What good did it do? I really feel for Cindy. Here she's put it all on the line, giving up years of her life to try to get this war turned around, stop the killing of innocents in Iraq and stop the meaningless slaughter of our own soldiers. According to www.iraqbodycount.org, at least 64,632 Iraqi civilians have been killed by combat since we started this pre-emptive war. 3,465 US soldiers have been killed in that time. Just this month, so far, 113 have been killed. When will be stop this bloodshed? How will more killing end the killing? Cindy, I'm with you--in feeling that this country is way out of wack with real life. I don't blame you for throwing in the towel. I just hope at some point you'll be swept in another wave of patriotism that proclaims that we will do no more killing in the name of peace, and that you won't be the only voice crying in the wilderness. We watched this movie last night, about the life of Dorothy Day, who started up the Catholic Worker movement. We were shown a clip of the movie at the Clergy Couples Retreat at the beginning of May. Oh yeah, I promised to tell you about that and haven't yet....it was basically perfect in every way, and I don't know what to really report about it, other than the location was wonderful--Asilomar was the perfect place for such a retreat--and the speaker was great--Dr. Stephen Muse, a psychologist, started with places I knew and was familiar with but then launched into something totally new and wonderful. He's written books--I haven't read any of them yet, but I'd recommend them if they're anything like his presentations. And the rapport between the attendees was wonderful. There have been some shake-ups in this diocese in the last couple of years, and also there is great mistrust of psychology and touchy-feely things from some quarters of our clergy community, but I think just the right mix of people were there to make bonding as couples really a good thing. We've never before had any get-together of clergy *couples*--we usually meet as wives or as priests, but never together. It's been suggested for years but this was the first time we actually did it. And I can guarantee you that all the people present will make sure it isn't the last! And Jim Forest is the founder of Orthodox Peace Fellowship, and we had a great conference over the weekend, albeit without Jim. He is in poor health and couldn't make the trip. He lives in Holland, though we found out he was in the states, but visiting family, not coming out here. He worked as the editor for The Catholic Worker newspaper for a time, and knew Dorothy Day personally. We've been involved with the Catholic Worker house here in Portland for the last 9 months or so, and have immensely enjoyed getting to know the people and the work of this ministry. They have their potlucks on the first Monday of each month, and then discuss what everyone is doing, the work in the house (they provide a place to live for women transitioning from prison or homelessness) and needs of the community. It's about the closest to sharing everything in common that I've personally been involved with. I'm suddenly thinking, of course I should post about the upcoming Orthodox Peace Fellowship conference on my blog, as there are local people (Susan?) who may be interested in coming, and perhaps people from further away (Mimi? Dawn?) who'd like to come. "Upcoming" is an overstatement--it starts tomorrow! Sorry for the late notice. The Orthodox Peace Fellowship is an organization of Orthodox Christians who are interested in discussing ways of waging peace in our parishes, communities, nations, and the world. This year's conference is themed "Living Peacefully, Locally." Speakers will include: David Holden, psychotherapist, who will speak on Living Simply, Locally, and our Global Impact and Renee Zitzloff, who is the coordinator of the Minnesota OPF chapter, who will speak on Local Chapters and Community Development. And my own dear husband, Fr. Paul Schroeder, will speak on Friday evening on Holy Simplicity: St. Basil the Great and the Ethic of Sustainability. And I am the newly appointed regional coorditor for the conference! So you can email me at mamaelizabeth@earthlink.net if you'd like to come and I'll sign you up. :-) The day rate is $50 which includes the Friday evening Vespers and talk, and the Saturday talks and workshops plus lunch. You can also purchase dinner separately on Friday and/or Saturday nights if you wish. The full conference rate, to stay at the retreat center for the weekend including meals, is $250. 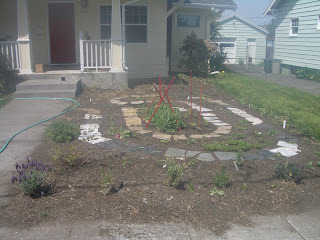 We've gotten lots of outside projects done at our house in these six months we've lived here (yeah, it's been that long!) but not much inside besides just plain old organizing. Today we decided that there were things that *had* to be addressed in the kitchen. 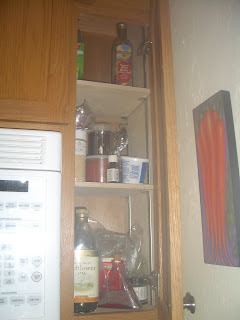 We started noticing quite soon after we moved in that there was something not quite right about the cabinets....they are beautiful, but the hinges were coming loose. We've thought that the wrong hinges were used, but it wasn't quite that bad. It's that they used 1/2 inch screws. What were they thinking? That isn't going to hold anything! So, the first project of the day is that Paul replaced every cabinet hinge screw with much longer ones. This cabinet, I've thought ever since we moved in, need more shelves. It had wood in the back but no tracks to put them up. Paul got them installed today. Now I have much more useable space in there and I don't have stuff all piled up on each other. 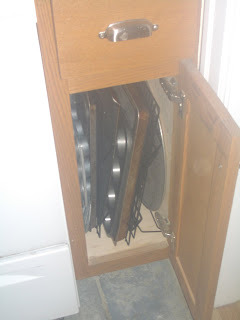 And I'd thought as soon as I saw this cabinet that it would be the perfect place to store flat pans upright. Until I opened it and found a shelf in there! So Paul took it out today and now I can line up my cookie sheets and pizza pan and muffin tins and cooling racks. And here there was a disaster! Just too disorganized. 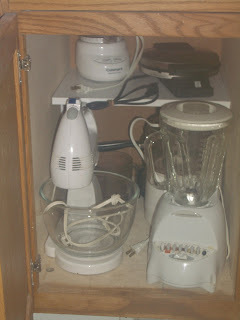 There was no shelf in this cabinet either, and all my appliances were in great disarray. Paul installed a half-shelf and now everything just fits in there perfectly! 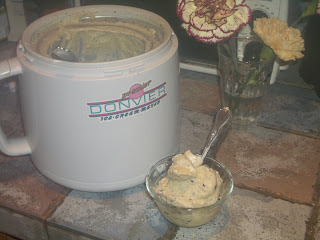 And, after all that hard work, I decided to make my first ice cream of the season in my Donvier. Easiest ice cream maker ever. Cookies and Cream! 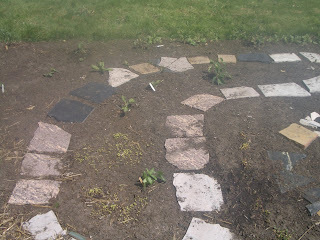 Update of my garden! 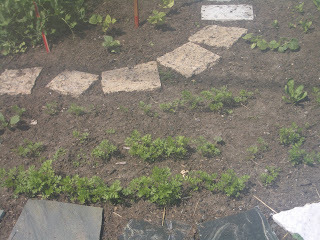 Actually, this first radish picture is from...maybe three weeks ago? 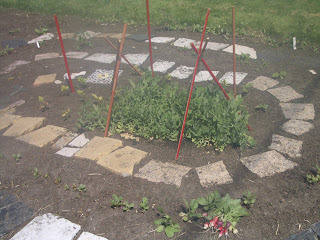 I've been getting radishes for quite some time already. They are very rewarding! Easy to grow and quick, and what beautiful jewel colors! 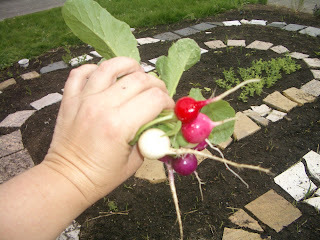 The beautiful radishes I picked today. 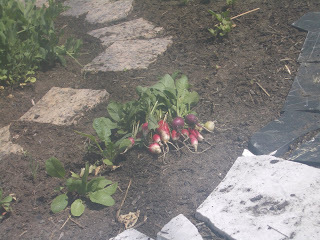 Did you know that in addition to being a tasty snack out of hand, you can cook radishes? I like them in stews and stir-fries. You can also add the greens. Kale! It's big enough to think about what I'd like to first make with it. Caldo Verde, or something different? I think I might just serve it tomorrow night when we go for house duty at the Dorothy Day house, all by itself, sauteed with garlic, alongside some pita veggie "patty melt" sandwiches that I found the recipe for in the Oregonian yesterday. 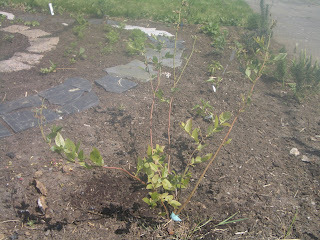 We bought five blueberry bushes when we first made the garden, and they are doing so well! I think we're going to have a lot of berries, for a first year. There were lots of blossoms. Basil! 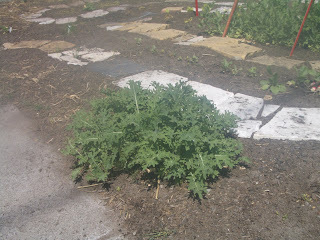 My very favorite garden plant! It's coming up all over here, but it's been growing so slowly that I got impatient and bought a plant today and plunked it in the middle. We've already been enjoying basil from the farmer's market--we just ate pasta with pesto for dinner tonight. 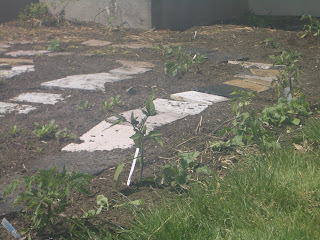 And the whole garden. We've been enjoying it immensely. Hibi again has a blog! Isn't this, what, your third blog, Hibi? I hope you don't delete this one! Keep on bloggin'. Yesterday we stopped at New Seasons after our dinner out, to get ice cream to make ice cream sandwiches with the peanut butter cookies I had made (yum) and lo and behold, what did catch my eye in the dairy case but THIS! 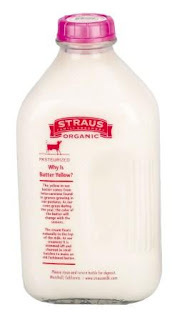 I first discovered Straus milk when we were living in central California, out in the middle of nowhere. Straus milk, it is not an exaggeration, is one of those little things that made living such an isolated life bearable. It is pasteurized but not homogenized, which means it's not raw milk but the milk and cream have not been bound, and usually when you open a bottle (which is glass and re-usable--take it back to the store to get your deposit back), especially of the whole milk, there is a clot of cream at the top that must be stirred in. (Or skimmed off to be used separately!) This milk has such a wonderful flavor--I thought immediately after the first sip I took of it that *this* is what milk is supposed to taste like. Okay, so it'll probably only be a once-in-awhile luxury. One I'll look forward to. Who, as it turns out, was the son of Eli, called "reprobates", guilty of unlawful practices, immoral, Eli's warnings rejected by, cursed by a man of God, warned by Samuel, ark takent to battle by, slain in battle, and news of, causes Eli's death. At least according to my Biblical Cyclopedic Index. I wonder if this is an omen of some type? If you'd like to do this meme, let me know in the comments and I'll come check it out! I signed up for a daily email from a speaker at the unschooling conference we attended in April, and I really liked his posting for Mother's Day. He says to share what he writes freely, so I will, with attributions. I like this because I'm often chagrined to hear that what some moms want most on Mother's Day is to get away from their little brats. I think that's sad. My children are what made me a mother and I celebrate motherhood! When we decided to stop at two children because of realizing that overpopulation was really doing a number on our planet, I thought it was a good and responsible decision. And I applaud people who have taken that principle even further and don't have any children. Yet, when I think about whether I could have done that if I'd had the consciousness before I had kids, I just don't think I could have. Childbirth was such an amazingly empowering moment in my life (times 2), and having the experience of bringing a child out of my body, feeding that child from my body, and nurturing that child (both of them) to maturity (ongoing) is just an incredible experience. I know I wouldn't be the same person without being a mother. Last night I received an email from a friend who had emailed some mom friends, thanking us for helping her along with her mothering. And I think it's true: we do help each other in parenting, because none of us exist in a vacuum. To all the moms out there, thank you for being good moms and for all the influence you've been in my life and my kids' lives. It's a chain reaction--even if I've never met you, I've surely "met" something that you've influenced. And finally, on this Mother's Day, let's not forget the original intent of Mother's Day. It was founded as an activist holiday. It was a mothers movement to stop all war. It was a call to teach our sons (and daughters, these days) to be peaceful and to resist the call of the forces that be to go out and kill other mothers' children. Julia Ward Howe is the originator of this movement, and I give honor to that mother today. And I'll end by posting her Mother's Day Proclamation here. whether your baptism be that of water or of fears! come to us reeking with carnage, for caresses and applause. those of another country to allow our sons to be trained to injure theirs." does not wipe out dishonor nor violence indicate possession. all that may be left of home for a great and earnest day of counsel. them meet first, as women, to bewail and commemorate the dead. impress, not of Caesar, but of God.